bessie wrote: And plytho, let us know when you're back. We hopefully won't need a replacement, but unfortunately RL issues happen. I'll be back around the 13th of august. Im home Thurs. Will do it then, if I forget just do mine randomly. @LaserGuy: I am still thinking about this post. And I’m also thinking about Vicarin’s comment in the post following yours. Do you have a breakdown by factions, not just by town/non-town? I could work it out myself, but I thought I’d check and see if you already did it. Ok everyone, you only have a couple days to sign up for Wheel of Time 3! Or volunteer to co mod! This is sure to be a very fun game, you won’t want to miss it. Something like this? Not positive I got them all correct, but should be pretty close (Diablo I think is wrong; should be 9-3-1-1-1, IIRC). The spreadsheet is here if you want to play around with the data. I'd call fridge 3 scum with a handicap. 2/1 seems like the scum weren't working together. Evil George Washington wrote: Jimbobmacdoodle, do you go by Jimbobular on Nintendo Switch by any chance? I do not, no. I don't even own a Switch. In fact, I don't think I've even had the opportunity to play on one! I think jimbobmacdoodle is the only username I use anywhere of note. LaserGuy wrote: The spreadsheet is here if you want to play around with the data. Why yes, I do want to play around with the data. How did you guess? I was thinking about Vicarin’s comment about three full scum being a break point, and about how this relates to three full scum on the same team (see also BoomFrog’s comment about working together in Fridge). I’m not sure that the size of the scum team in itself is as significant as other factors. 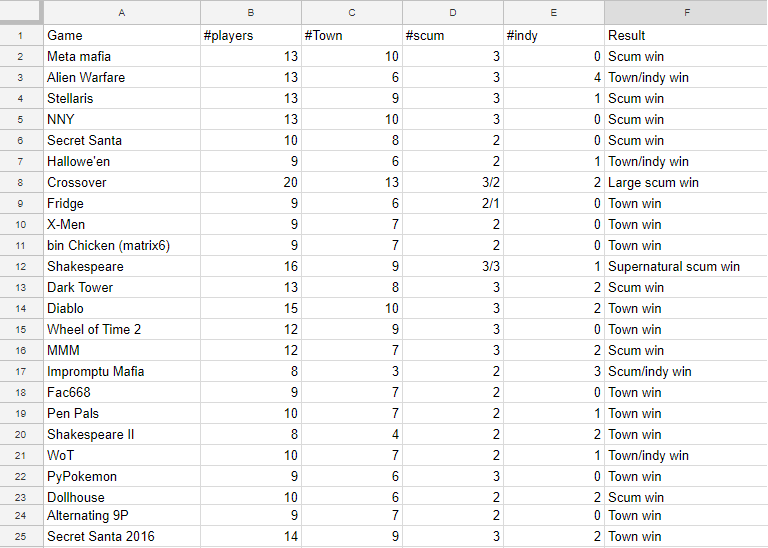 I’ve thought for a long time that the most important ability in a game was chat (scum, mason, etc), and I need to work on this a bit to see how wins correlate with day chat (does scum with day chat have a higher win rate, what about town with confirmed mason chat, etc). Other game mechanics things to consider: hard vs. soft deadlines, extensions, no lynch, ties, replacements, etc. I’ve also been thinking about some of your comments in your Meta Mafia QT notes. Unless hammering is required for a lynch (and even if it is, see Crossover), players are going to use the entire time allotted, because it is beneficial to town, and ending the day early will be viewed as anti-town so scum will also be reluctant to hammer. You might be interested in this game, where AdamH used bankable deadlines, I think there were other games and that it was also discussed in Gojoe or the Meta thread but a quick search failed me. If town hammers, they can apply the unused time to extend later days. EGW, you simply can not just appear out of nowhere and not talk about me me me! BoomFrog, really? Do I look like someone that can be that easily manipulated? Hmm, my avatar is, um, oh yeah. Never mind, O Wise One. With regards to town always wanting to use up the full time available, I think it was kind of funny that Stellaris D3 had town trying to rush the lynches near the end, with wam being the only person arguing to slow down a bit, and this in part helped wam get through to the end because noone was spending any more time analysing after each lynch what the situation must have been for the game to have not ended yet. While it does lead to days dragging out a bit, can't really blame town for trying to squeeze every drop of info out of the day. More games with bankable deadlines: ThunderDome Mafia, Discordian Mafia, and Jester Mafia. Brought it up here. Received little notice. Talked about turbo games around this point, mostly. Sorry guys, I've been busier today than I was expecting, and I doubt I'll get enough time during the week to do as much as I need to, so I don't anticipate the game starting until next weekend at the earliest. dimochka will be co-modding hopefully. Please include him on any WoT-related PM's from now on. Thanks Deva! I thought there was more discussion somewhere about bankable deadlines, but I could be misremembering because all those games were took place when I was still lurking. Maybe even before I was lurking. jimbobmacdoodle, I’m disappointed, I won’t have an excuse for not bringing home work this week. On the plus side, if there’s anyone else that thought they missed their opportunity to sign up for Wheel of Time 3, you have a few more days! Hm. Checked even further back. Mentioned bankable deadlines specifically in Gojoe earlier, apparently. Discusses deadlines occasionally. Centers around specific (five days) over vague (no deadline unless low participation) and overall game length due to long days. Spoke of players waiting for the full day length here, however. Used them in Terminator Mafia (according to the sign-ups) and The Sailors of Sea Nine too. Just a reminder I'm busy with limitedninternet for day 1 of wot. I'm back and need updates. When do we start WoT??? Sabrar wrote: I'm back and need updates. When do we start WoT??? That's way too long without mafia. Sorry guys, I've recently started a relationship, so my free time has taken a nose dive. However, this evening I put together a first-pass at the setup, and am just waiting on dimochka to take a look over. I'll put up the game rules post tomorrow, but role PMs might have to wait a day or two, depending on how long it takes me to write the flavour for them. Joking ofc, that's very nice. Best of luck with that! jimbobmacdoodle wrote: Sorry guys, I've recently started a relationship, so my free time has taken a nose dive. I officially approve of your reason for the delay! heuristically_alone wrote: That's way too long without mafia. Woof. It’s almost a year in dog-time. Sabrar wrote: HOW DARE YOU??? Sabrar wrote: Joking ofc, that's very nice. Best of luck with that! She if they'll co mod with you. Nothing is more romantic. So, I looked through the wiki jimbob linked to for my first choice, Brown Ajah, and I think it's basically Luna Lovegood. Wonder how that'll translate as a role. LaserGuy, I'm so happy to see you put a newbie game in the queue! Perhaps we can make it an actual real newbie game and try to draw some newbies, or some players that would prefer a more casual game with lower time commitments than the recent games. heuristically_alone wrote: She if they'll co mod with you. Nothing is more romantic. Oh dear. heury, you and I need to talk. random aside: I ran into KrO2 on reddit last month randomly (if by randomly you mean that I linked one of the posts in his now-defunct blog and he saw it / saw referrals because of it / other). Turns out he would have been willing to replace in meta mafia in a pinch. So.... I think we need to get a rolodex of people who posted Back In THe Dark Ages of Five Years Ago to unexpectedly pounce on for replacement requests. Heh. So my secondary win condition is to never be the first in a day to accumulate 2 votes. Not too hard. I just have to vote for the same person the first voters votes. (As long as it's not me). I'm back up townie, so no powers until a townie dies. I'm in both blue and black ajah, but my loyalty is more to blue (if I read mu PM right). Now to see how townie I can be this game. My secondary win is pretty rough. "Have a tie vote or no lynch while I'm alive." I'm going to be struggling to decide if it's worth reducing my prime win chances to get my secondary win. Best case I'm alive at MYLO. Who knows if we will get to MYLO or LYLO though. Also my main power is activated by not voting so voting to cause a tie is always bad for me. Last edited by BoomFrog on Wed Jul 25, 2018 7:24 am UTC, edited 1 time in total. WoT2 ended already, so can I read boomfrog's spoiler? Those following Madge's personal life: tomorrow I start at my New Role, and I'll be doing fatal crash investigations! So apparently I'll be rocking up to the site of a fatal crash within 10 days of it happening, taking measurements of the road, photographing the site, etc and then writing a very detailed report talking about what the road was like and whether it contributed to the accident. My manager-to-be also states I'll be learning how to inspect existing roads and intersections for safety issues and be given some serious training in becoming an "expert" in that. In a few months they're also hoping to get me onto something more engineer-y, coming up with ways to improve safety of large "programmes"/"sections" of roads. I'm getting terrible RNG, once again I'm scum (Traitor) without knowing who my allies are. My ability is weird and I can't really see a good use for it at the moment. Probably best to keep it in reserve and try to fake a townie-claim with it if necessary. heuristically_alone wrote: WoT2 ended already, so can I read boomfrog's spoiler? I officially approve of this reason! I’m so excited! I love my role pm! I’m Sabrar (I’m an overconfident logician)! I should try to copy his meta for this game and see if anyone notices. Not sure if I can keep up with the post count though. bessie – If you can’t figure this out this is my first post that you’ve ever read.